As a blogger we all suffer with moments where we question our blogs, look around at other blogs and then look back at ours and start to pick at the things we dislike about ours. We then start to feel like we simply aren't good enough. Blogs, especially beauty blogs are continuously growing so it's so easy to get down and question "is mine good enough?" and that's when the pressure can mount on. I will let you into a little secret. Shortly after I found out that I was shortlisted in the Cosmo Blog Awards I had this awful evening where I got really upset, I felt overwhelmed by being shortlisted, pressured to work with every brand/PR that came my way and really started to look at my blog and tear it to pieces. I felt over worked, I felt like I couldn't commit to the work I'd agreed to do and felt like I had failed myself. I started to look at other blogs, their followings, their comments ect and question why on earth I'm blogging, when I'm basically sh*t at it! It was a dark night, fuelled by other things going on in my life and everything, life, work and blogging just got on top of me. Luckily I received numerous supportive messages from fellow bloggers, but then I also received a few negative comments about being ungrateful, which I wasn't at all, I just allowed things to get on top of me. Luckily the majority of people knew where I was coming from and managed to help me and pull me out of feeling like crap. You see my life this year has gone through some major changes, things that I don't talk about in public, but my blog has actually been my saving grace. It has allowed me to have something to really focus on and keep my mind occupied while my life goes through a big transition stage. I know a lot of bloggers go through the whole doubting stage and can find it hard to pull their self out of it. I thought I'd share a few tips that have recently helped me over the past few months deal with work load, the ever growing pressure to be the best and remember why I started JustJulie! Be Proud of what you've achieved. Now this can be anything from improving your writing skills, improving your photography. You could have designed your whole blog by yourself and learnt a little bit of HTML code a long the way? How amazing did you feel when you first hit 100 Bloglovin followers? I know I felt amazing! Personally I'm proud of how much my photography has improved, there is still room for improvement, but I feel like I'm on the way. I also can now write, take photos, edit photos for a post much faster than what I could 6 months ago. Although I'm not an expert blogger, I'm proud of how much I have grown. Don't compare, instead take inspiration. Anyone who has said they have never compared their blog to another blog would be lying. We have all been there. Maybe it was when you first started blogging, it could be 6 or 12 months down the line, we have all done that at some point. You see your favourite blog? I'm sure they too have felt the same as you at one point. Instead, take a look at your favourite blogs and just take inspiration from them. Do they have a blog series that you adore? Why not start your own series? What makes a blog stand out is a blog that is a true reflection of the writer. It can take some time for people to find their own voice, but once you do, your blog will just shine! Don't get caught up by numbers. This is something I have spent too much time focusing on. I would be checking my follower count on a daily basis, I'd thoroughly go through all my views and would be disheartened when a certain blog post didn't perform how I thought it would do. I've since realised that by checking my followers and stats on a daily basis wont help my blog. Instead I try to focus on seeing what blog posts are performing better than others, this way I know what posts are the most popular, so I get an idea of what my readers are enjoying the most, this way I can bring out more content that I know people will wont to read, which in turn will naturally help my followers grow on it's own. I now just check my Google Analytics once a week. Planning, scheduling and getting organised. Now I'm not saying you need to set yourself a strict schedule, this works for some people, but doesn't for others. Over the past two months I have been planning my posts in advance. Now this could be just jotting down ideas, writing a few drafts or taking photos of future product reviews. I bought a planner that I now carry around with me. I write in my work schedule, any social plans I have and then I can see what free time I have to spend on my blog. I work 40+ hours a week and spend around 30+ hours on blog every week, so for me I really need to plan my whole life in general so that I don't become too over worked. Some people may feel like this is putting more pressure on me, but it really isn't. I've found that becoming more organised has taken a lot of pressure of me and I have more free time than I did before. Don't let your blog take over your whole life. This kind of ties in with the above post. I found that I was allowing my blog to take over every free time I had, and although I want my blog to be successful, I will not allow it to get in the way of having a life away from this computer screen. If I'm organised well in advance, I actually can give myself two or three days a week away from my blog, where I can just have a relaxing evening watching my favourite tv shows or go out with my friends. If I need a early night, I don't want to feel like I can't because I need to be on Twitter joining on the twitter chats or having to write a post up. If I don't allow myself to have some down time, then my blog, work and social life will suffer massively. This is a work in progress, but I do find that I really need to switch off from all things blog related every now and then, so if I'm prepared in advance then I can do just that! Enjoy what you do. The most important thing is that you must enjoy what you're doing. You started a blog because you wanted to do it, but we all get times where the pressure makes us not enjoy it, where everything becomes a chore. The moment you stop enjoying it, is the moment where you need to take a few steps back. Now this could be for just a day, it could be for a week or two, however long it takes for you to figure out what makes you happy and refocus. You as a person will feel better taking a break, you will feel more motivated, which will result in even better content. Your blog will still be there when you get back, as will your followers, and who knows, the break may help you gain new followers as a result? Of course everyone has their own way of dealing with things, but these few have really helped me. I still have room for improvement within all of these points but I feel like I'm getting there and not getting too stressed out by things. I'm 100% enjoying blogging more and I believe that is the most important thing. 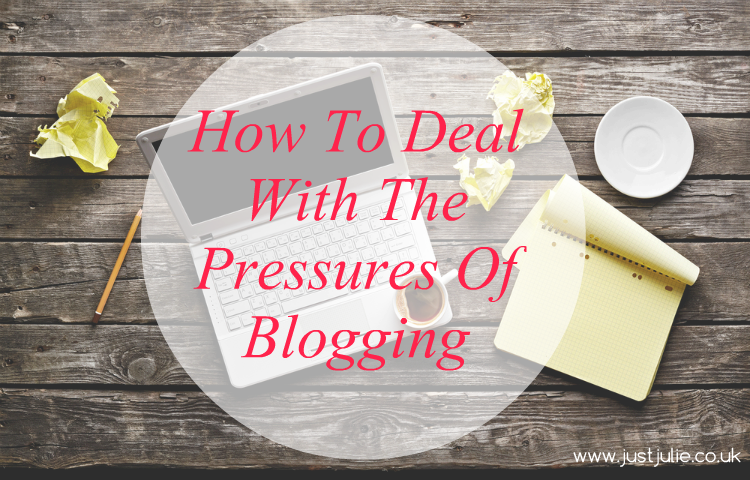 People think blogging is easy, it's not at all, but if we put too much pressure on ourselves then things become even more complicated. When I feel bogged down, I try to remember why I started JustJulie, how far I've grown and the little accomplishments that I've made along the way and that's usually enough to pull myself out of it! What tips have you got to help pull yourself out of the doubting stage and pressure?